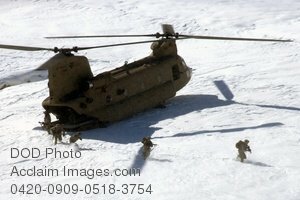 Description: Free, public domain image: American Soldiers Exiting a CH-47 Chinook Helicopter in Bagram Afghanistan. U.S. Soldiers from Alpha Company, 1st Platoon, Personnel Security Detail, 101st Airborne Division exit a CH-47 Chinook helicopter to provide security in Bagram, Afghanistan, Feb. 15, 2009. (U.S. Army photo by Sgt. Prentice C. Martin-Bowen.